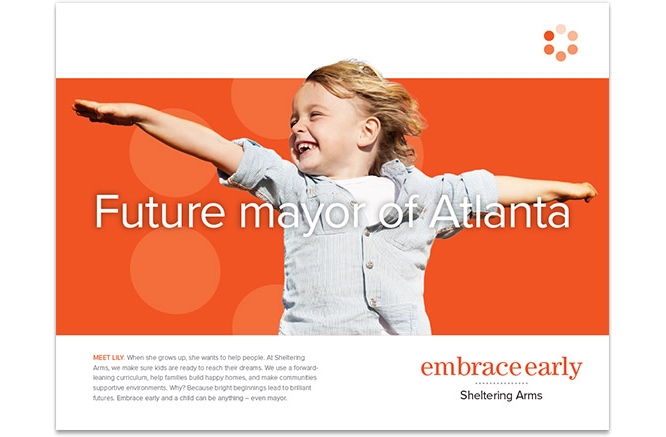 Sheltering Arms, an Atlanta institution, has a history of doing whatever it takes to help those who need it most. 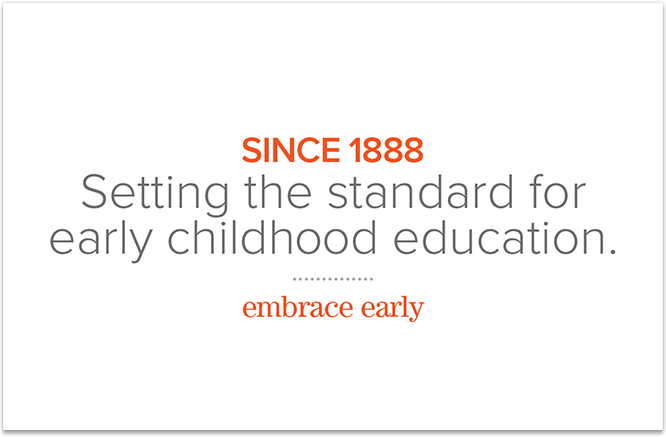 Despite 130 years of educating Atlanta’s youngest students, Sheltering Arms was an unsung leader in early childhood education. 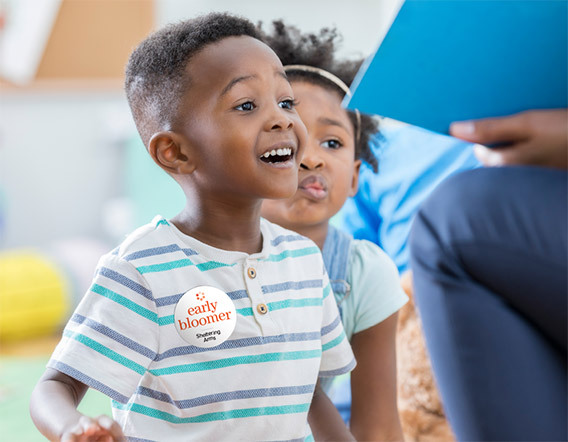 So what would it take to be recognized as the highest-quality, most forward-thinking education experts for every child? 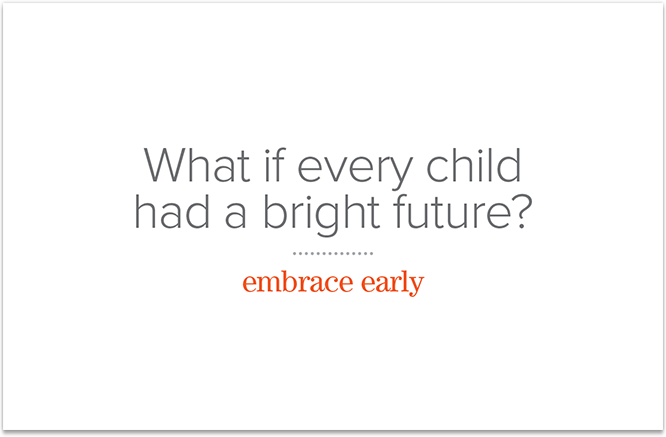 You show the world why we all need to “Embrace Early.” Because a child’s bright beginning is the start of a happy future. 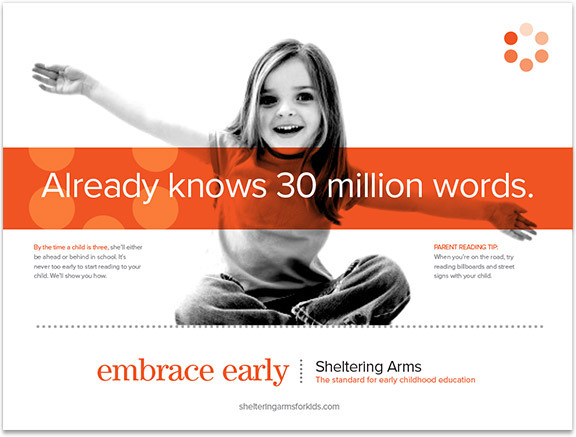 In a brand awareness campaign, we positioned Sheltering Arms as a leader in early childhood education and the voice of a movement. 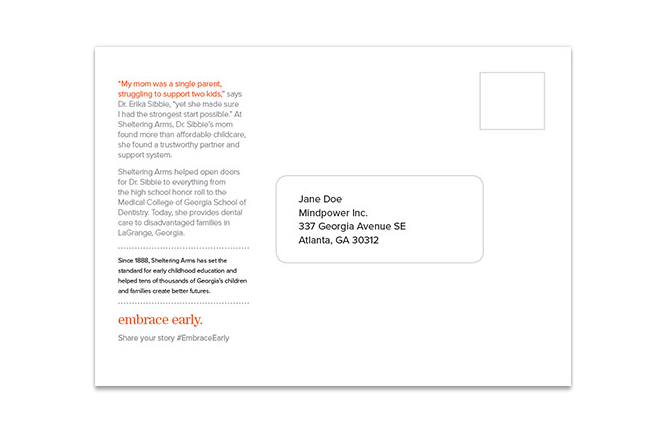 To give the campaign clout, we leveraged impressive facts, Sheltering Arms’ history and pioneering methods, and alumni – to show who children can become with a good early education. We created a new visual icon – affectionately called “The Huddle” – that represents a diverse group of people gathered together to better each others’ lives. 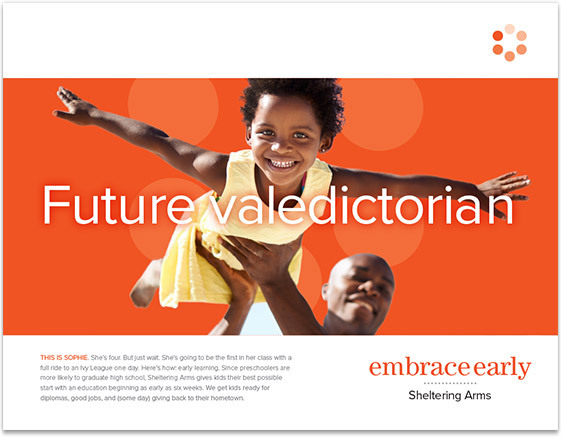 It stood out among the competition and united all of Sheltering Arms’ divisions, from childhood education to teacher training to family support. 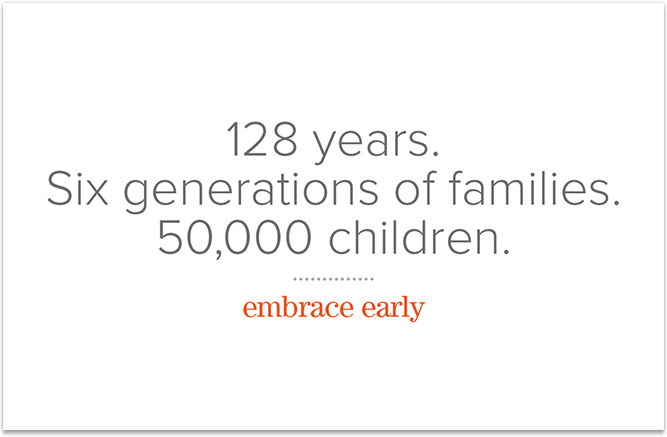 We also made the decision to claim orange, a warm, cheery, eye-catching color. To ground the Embrace Early movement in something visual and physical – a kind of calling card – we came up with “Arms Out,” a symbolic embodiment of welcoming an embrace. Our thinking? 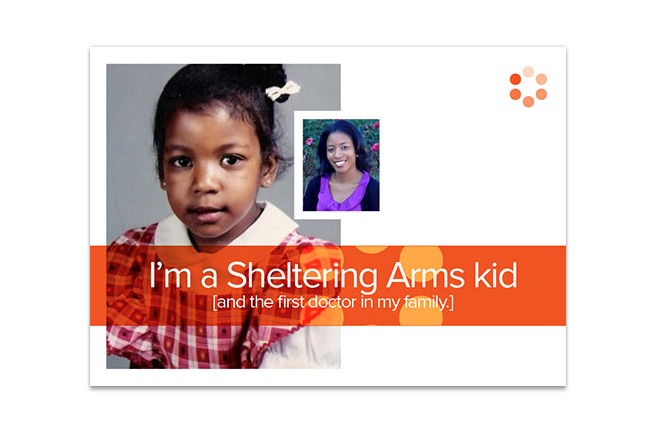 When you see or do Arms Out, think Sheltering Arms. 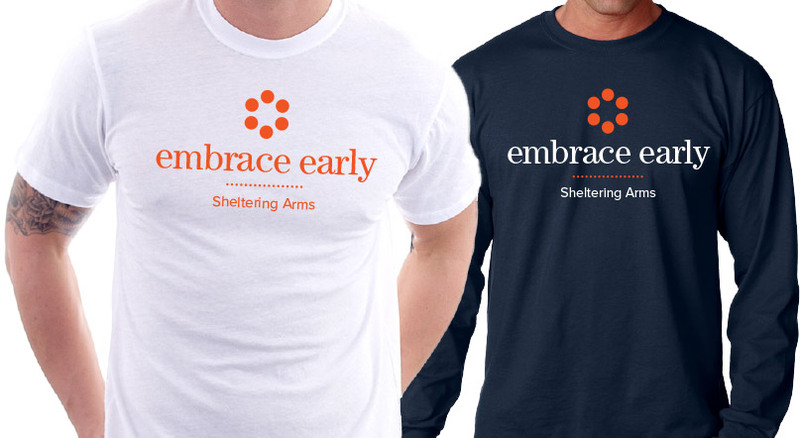 Sheltering Arms totally embraced Embrace Early. The rebrand officially launched with a new facility. 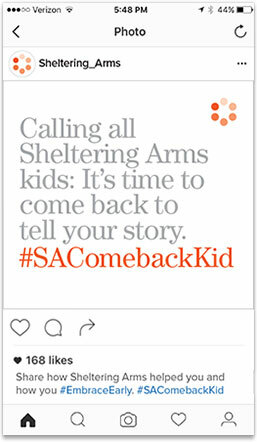 They’re owning orange and implementing the language and visual elements – from t-shirts, stickers, and signage to fundraising and the #SAComebackKid campaign, which they started via email and social media. 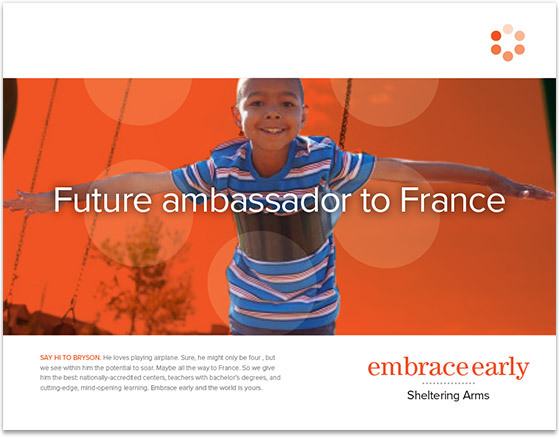 Sheltering Arms also overhauled their website using the new brand as its springboard.